I visited The Cornstore on a Wednesday evening in February and despite what must still be a challenging time for many restaurants, the Cornstore was already lively and living up to its strong local reputation. Quickly seated in a cosy booth, my colleague and I began to study the menus. The restaurant describes itself as “Manhattan Style, specialising in seafood and steak”. In keeping with this, the majority (but certainly not all), offerings and specials were indeed surf or turf. There’s a ‘value menu’ supported by a more extensive a la carte option, between them there was plenty of choice. With a menu for speciality craft beers and stouts, many of which are Irish, a wine list and the cocktail list, you’re almost spoilt for choice. A carafe of water was brought to the table without request, which is a nice touch. I thought the wine list was a little on the pricey side, but was clearly laid out and also had plenty of choice, albeit much priced above my tolerance. 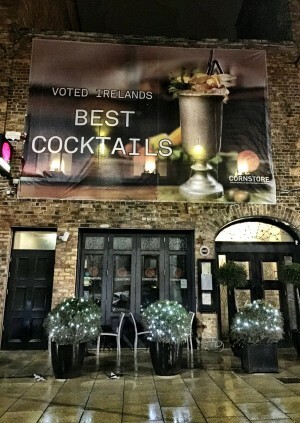 The Cornstore has won many awards and endorsements, most recently you’d be led to believe, for “Ireland’s Best Cocktails”, (which was actually “Cocktail Bar of the year 2014”), a detail the 50 sq foot sign outside fails to mention. It’s also missing an apostrophe, (but I always was a self-confessed pedant). Let’s not detract from the food and service, which were both very good. Going straight in with main courses, we opted for a medium-rare rib eye and the pan seared chicken supreme. Served with mashed potatoes, (like only the Irish do), we also opted for a side of chips to share. It was only the next day that the starter of chicken wings was recommended as the choice of champions, something I’ll be sure to remember on my next visit. The presentation of both dishes was excellent and were served piping hot with little delay once ordered. My rib eye was probably more medium than medium-rare, but I love steak blue thru burnt, so that’s not a criticism, merely an observation. The chicken dish looked equally as appetising, served on a “Cornstone coddle of baby potatoes, savoy cabbage and garlic sausage”, and I would happily have been served either meal. To finish we both had a crème brûlée, which I confess I have never had chilled before, but it too was delicious. Whilst we were deliberating whether or not to choose a dessert, our waitress pointed out that it wouldn’t be charged, as it was inclusive on the value menu. It was a little surprising therefore to see them both charged individually once the bill arrived. I guess the missing charge for the chips was some consolation. Merely to cleanse the palate you understand, we succumbed to the temptation of a couple of the Cornstore’s famed cocktails. The Mojito and the Whiskey Old Fashioned were an indulgent way to finish the experience and we were in agreement that we’d certainly revisit to explore the different menus again. The Cornstore is clearly a successful restaurant which exceeds many of my minimum criteria but excels with its lively atmosphere, relaxed attitude and friendly service.